Choose from the Tile Mate, Tile Pro, and Tile Slim. We all know the age-old annoyance of losing our keys, phones, and other small-but-necessary objects. Tile is here to help with that, providing handy little Bluetooth-equipped “tiles” to help track down your missing stuff. And today, you can choose from two different bundles, each with a second-gen Echo Dot that’s essentially free. 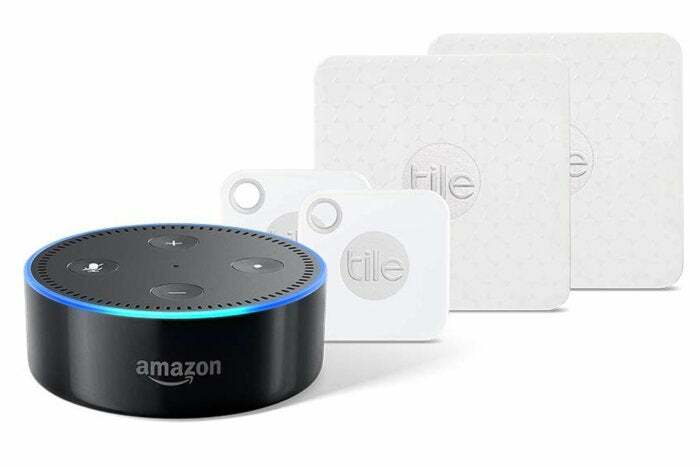 A bundle with two Tile Mate, two Tile Slim, and an Echo Dot is $60 on Amazon, down from a list price of $110, and a bundle with four Tile Mate + Tile Pro (two each in black and white) and an Echo Dot is $100, down from a list price of $140. All three Tile varieties in the sales have the same basic item-finding abilities. Once you’ve attached a Tile to an object and paired it to your phone, you can use the app or tell your Amazon Echo to make it ring if it’s within Bluetooth range. (Protip: slip one in your wallet or purse!) You can also see the last place your Tile checked in, so you’ll be able to get an idea of your item’s general vicinity, allowing you to get close before ringing it. There’s also a Community feature which allows you to be notified if your Tile is identified by other users’ devices. There are a few differences among the bundled Tiles. The Tile Slim is, as the name suggests, the thinnest of the offerings. Because of this, it doesn’t have a replaceable battery, but it slides easily into narrow places like wallets. The Tile Mate has a Bluetooth range up to 150ft., as well as a ring that is 1.5x louder than that of the Slim and a replaceable battery. Finally, the most expensive of the three, the Tile Pro, features a ring 3x louder than that of the Slim, as well as a Bluetooth range up to 300ft. and a replaceable battery. All three can be found via voice control using the Tile skill in the Alexa app.